The papers are not yet available for research. Papers: In the Allan Cromley Collection, 1946-1995, 18.6 cubic feet. Persons represented include Steve Largent. Videoreels: 1994, 12 commercials on 9 videoreels. 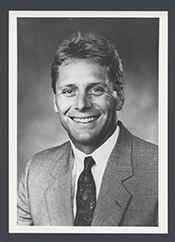 The commercials used during Steve Largents campaign for the 1994 U.S. congressional election in District 7 of Oklahoma, Republican Party.